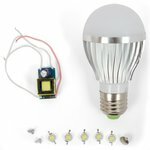 High quality LED light bulb DIY kit (natural white, E27) which consists of lamp housing, LED driver, and a 7×1 W LEDs. 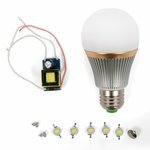 High quality LED light bulb DIY kit (warm white, E27) which consists of lamp housing, LED driver, and a 7×1 W LEDs. 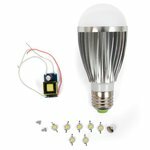 High quality LED light bulb DIY kit (cold white, E27) which consists of lamp housing, LED driver, and a 7×1 W LEDs. 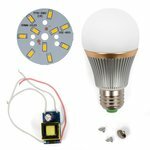 High quality LED light bulb DIY kit (natural white, E27) which consists of lamp housing, LED driver, and a 5×1 W LEDs. High quality LED light bulb DIY kit (cold white, E27) which consists of lamp housing, LED driver, and a 3×1 W LEDs. 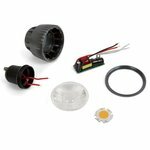 High quality LED light bulb DIY kit (warm white, E27) which consists of lamp housing, LED driver, and a 3×1 W LEDs. 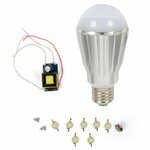 High quality LED light bulb DIY kit (cold white, E27) which consists of lamp housing, LED driver, and a 5×1 W LEDs. High quality LED light bulb DIY kit (warm white, E27) which consists of lamp housing, LED driver, and a 5×1 W LEDs. High quality LED light bulb DIY kit (cold white, GU10) which consists of lamp housing, LED driver, and a 3 W COB chip. 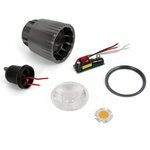 High quality LED light bulb DIY kit (warm white, GU10) which consists of lamp housing, LED driver, and a 3 W COB chip. High quality LED light bulb DIY kit (warm white, GU10) which consists of lamp housing, LED driver, and a 5 W COB chip. 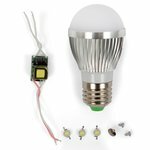 High quality LED light bulb DIY kit (cold white, GU10) which consists of lamp housing, LED driver, and a 5 W COB chip. 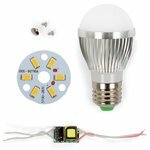 High quality LED light bulb DIY kit (warm white, GU10) which consists of lamp housing, LED driver, and a 7 W COB chip.